Mark Goodacre has posted his SBL critique of Zeba Crook’s Parallel Gospels, which should be read before going further. Mark was one of four reviewers at the SBL session (the others being Struthers Malbon, Paul Foster, and Robert Derrenbacker), to whom Zeba responded at the end. Zeba has given me permission to post his response-paper, but I’ll just paste the Goodacre part, since the other three reviewers haven’t (to my knowledge) made their papers available online. Readers of this blog know I hold both Mark and Zeba in high esteem, though on inter-synoptic issues, I obviously tend to see eye-to-eye more with Mark. But I haven’t read Zeba’s book and can’t offer any critical assessments at this point. So read Mark’s critique and Zeb’s response, and weigh the wisdom of each. “Goodacre suggests that word-level parallels are key to sound synopsis construction. I wholly agree, so let me explain. This is ideal synopsis construction meets real world market. I think Mark would have loved the original synopsis that OUP saw. But the synopsis OUP saw was over 500 pages, because lining up parallel words on parallel lines creates a lot of white space on the page. Now I really liked that white space; I felt it gave the student room to think. OUP didn’t. They wanted a synopsis that was going to be affordable, and this one really is. Making the synopsis Goodacre wants would have been ideal, but it also would have been much more expensive. “In the end, we (OUP and me) opted for a compromise: Words that begin a short syntactical section are paralleled. So, in the section to which Mark refers (#184; Matt 18:2//Mark 9:36//Luke 9:47b), it is true that the three instances of “young-child” are not on exactly the same line. But two lines above clearly starts a new section, beginning with the triple agreement on the aorist participle (having-summoned in Matt; having-taken in Mark; and having-taken-hold-of in Luke). So the very short section lines up at the start, and it lines up at the next stage (Matt 8:3 and Luke 9:48 == Mark doesn’t have any text there), and then after Matthew’s verses 3-4, the three line up again at the start of the next section (Matt 8:5, Mark 9:37; and the continuation of Luke 9:38). A compromise had to be struck, between ideal synopsis construction and marketability, and I think this is actually a good compromise. Goodacre complains that it makes the student work harder, but I actually came to see this as an added benefit: my original synopsis was so word-paralleled that it left almost no work for the student to do! “Next Goodacre comments on problems with clarity and readability that are the result of my one-to-one translation principle: that cuts me to the core, Mark. Everyone here needs to understand how much sleep I lost in the decade I spent on this book over the issue of readability. I don’t need to be told that hupo with the genitive means ‘by’ not ‘under.’ I don’t need to be told that tis with an accent can mean who AND what. But in end I had to decide that if my goal was to devise a way for the non-Greek-reading student to see what words the gospel writers shared, how they may have changed words and phrases a lot or a little, over and over again, then this was the only way. I had to accept that the goal was NOT translation, but rendition, and I had to accept that readability had to be sacrificed. But then I also realized this: if I wanted to produce a source-language translation, I had to follow through on it. The translation Goodacre wants in a synopsis already exists out there (in multiple forms), and they all show that tis can mean ‘who’ and they show that Jesus was baptized ‘by’ John, but they also produce endless false positives, false negatives, and generally create agreements where none actually exist. My goal was to create a new synopsis, not duplicate existing synopses. “But then I realized this: synopses exist for only two reasons: to be able to compare gospels structurally and at the level of the minute detail. These details are the foundation of source and redaction criticism. The reader who wants readable ‘scripture’ can go to target-language translations like the NRSV or NIV; the reader without Greek who wants to be able to really see word agreements and disagreements among the Greek gospels needs this book to be able to do that. No other English synopsis book will give them that. Mark is not wrong: the translation is a challenge to read; but what the student gains from that translation is greater than the cost. I’ve been told on many occasions that students, after a couple weeks of grappling with the strange translation, have a eureka moment in which they both ‘get’ what’s happening and find their eye can do the necessary skip and dance to read it somewhat fluidly. UPDATE: Mark Goodacre responds to Zeb’s response. 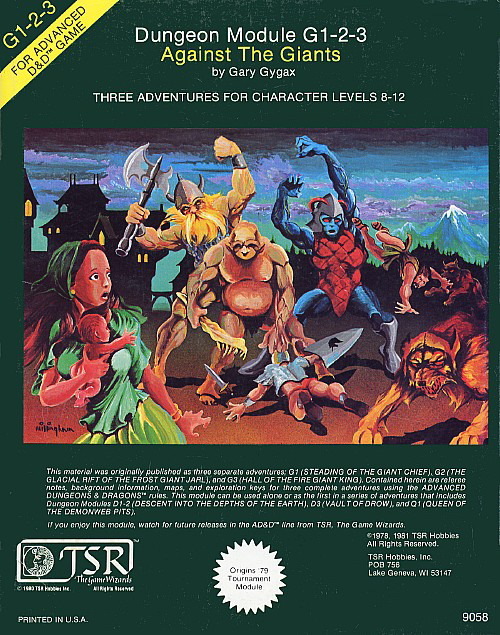 The most epic D&D campaign of the old-school era is the seven-module series later packaged into four: Against the Giants (G1-G3), Descent into the Depths of the Earth (D1-2), Vault of the Drow (D3), and Queen of the Demonweb Pits (Q1). From murderous dungeon crawls, to lethal underworld domains, to the unforgiving Abyss itself, players take on a coalition of giants in thrall to a group of drow (dark elves) whose hideous cultic allegiance spells disaster for the surface world. I suspect, however, that most DMs proceed on the design that Eclavdra (or her clone) has a backup plan in reserve if the giants fall, and that most PCs will assume that a drow attack on the surface world remains a viable threat. Otherwise there would be no point in pursuing the drow to their home under the earth. I never heard of PCs invading the underworld for pure vengeance or curiosity sake, though of course either scenario is possible. For myself as a DM, the Eilservs weren’t giving up, regardless of the outcome in the fire giant hall. More to the point, even granting the two factions of drow posted there, it’s exceedingly unlikely that PCs will have deduced (by the end of G3) that Eclavdra’s crusade is opposed by most of the drow community. I’m not so sure. There is a third possibility which straddles these two options, and indeed the one that seems to form the premise of later campaigns developed for 3rd edition D&D: that “marauders [PCs] from the upper world assaulted not only the Eilservs estate, but also the Fane of Lolth itself” (Dragon #298, p 84), which initiated an all-out war on the upper world, this time spearheaded by Lolth (who in the G1-Q1 modules opposed such action), as well as a civil war in the Vault (the priestess wars). I never heard of PCs who went into the Vault without, in some way, striking against the Fane. 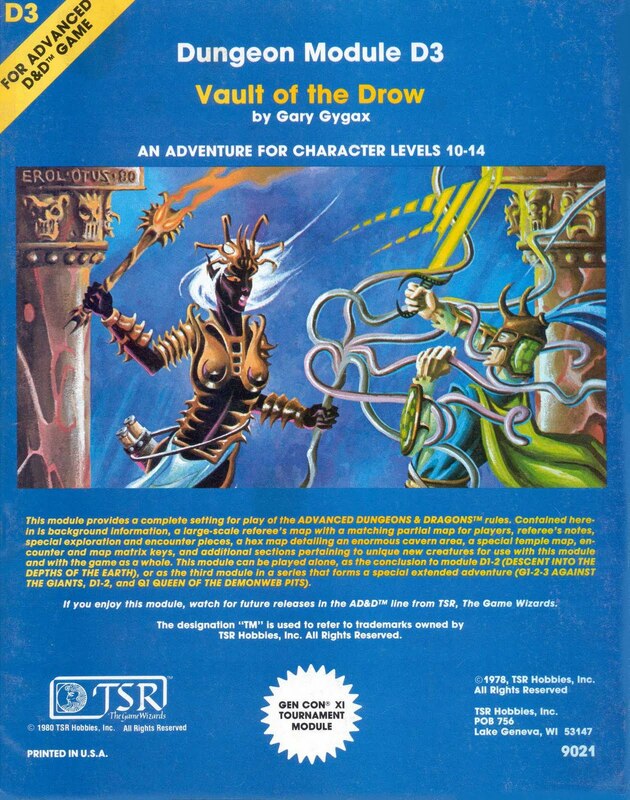 Granted I had a poor understanding of how to run Vault of the Drow in my early gaming years (see here, #4), I’m dubious that players, without heavy-handed steering from a DM, can bring themselves to ascribe to any drow faction a complete hostility/opposition to the spider goddess. After all, House Eilservs still coexists alongside the other Houses, right next door to the Fane. Furthermore, option (2) is a reasonable conclusion in any case. The feud between House Eilservs (serving the Elemental God and allied with House Tormtor) and the Fane (serving Lolth and allied with all the other noble houses) owes to local politics, namely Eclavdra’s desire to set herself up as Queen of the Drow, thus undermining clerical autonomy. Her crusade against the upper world is intended to consolidate a power base more than anything, but the fact is that all drow are ultimately driven by their ancient grudge against the surface, and not least Lolth’s priestesses. Subjugation of other races is hardwired in drow genes; if one house can start a crusade out of self-interest, so can another, and so (especially) can the Fane. What the Fane is opposing is not a crusade against the surface per se, but Eclavdra’s crusade and her bid for power, which also promulgates the worship of a rival deity. Only PCs with high risk-addiction complexes would likely try allying with the Fane, as Bloch suggests, even on the logic that “the enemy of my enemy is my tool”. If the drow were lawful-evil oriented, that would be one thing, but they’re intrinsically chaotic and poisonous like the spiders they nest with. Getting in bed with the sisterhood is arguably as much an invitation to the grave as declaring war on the Vault. Lolth, for her part, thrives on the divisiveness and backbiting of her people, and would characteristically shaft any makeshift allies (especially foreign ones) at first opportunity. All things considered, PCs would be justified in concluding that the Fane is the ultimate (if not immediate) menace, and in striking a blow against both it and the rebellious Eilservs to send a clear message. My point is not that restricting oneself to Bloch’s option (1) is necessarily misguided, just that it’s not the only sane course of action open to PCs. It’s possible, with enough shrewdness and care, to strike against the Fane without having to take on the entire Vault. On the other hand, I agree completely with Bloch that there isn’t much reason, per the plot design of G1-D3, for players to take the audacious step of confronting Lolth on the Abyss in order to kill her. 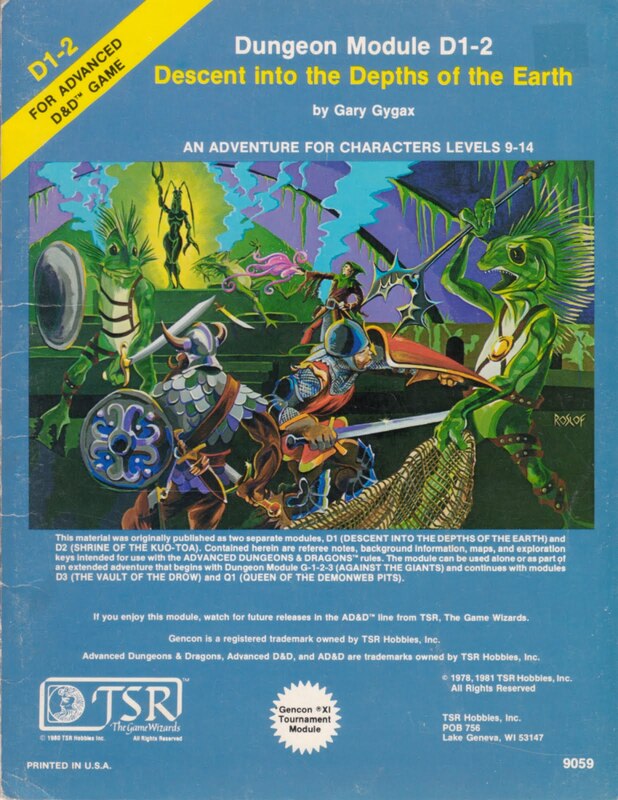 It’s been widely acknowledged how disappointing Q1 was in terms of design (as Gygax bailed on the project and left it in the hands of David Sutherland), but it’s seldom acknowledged how much of a non-sequitur it is. Q1 only makes sense if the PCs are overambitious hotheads or fools — or if they just want the orgasmic thrill of trying to kill a goddess on her home plane (which perhaps makes Q1 realistic after all!). 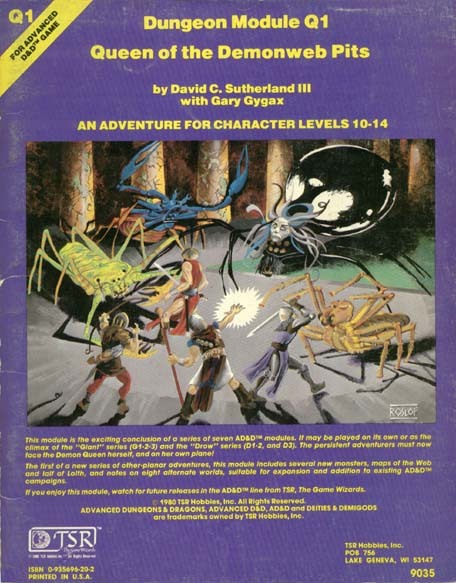 On the other hand, Q1 could become relevant at the later time, when Lolth takes over the assault on the upper world, which is the follow-up scenario designed for later editions of D&D. This sort of gaming philosophy is of course anathema to the script slavery and rigid plotting of later “modules” (Dragonlance and beyond), which hand-held DMs and predestined players. G1-Q1 are a healthy reminder that series modules can indeed work with minimal plotting. If I had to sum up the attraction of old-school Dungeons & Dragons in a single phrase, it would be: “simple rules, great modules”. Nowadays things are so backwards. There’s a D&D rulebook, it seems, for everything under the sun, and modules aren’t even close to what they used to be. You certainly don’t hear gamers rhapsodizing about modules like I did back in the day, when we couldn’t wait to get to the store to buy the new temple of darkness penned by Gary Gygax, or the coastal haunted house that masked a nefarious business. James Maliszewski has written extensively about the evolution of D&D modules, one of my favorite posts being Locale and Plot. Essentially, as Maliszewski contends, the D&D modules of the late ’70s & early ’80s focused on presenting locales with minimal plotting. Any plot resulted from a dynamic unfolding of what happened to the PCs once they were there, not something the module authors scripted in advance. Dragonlance (in 1984) changed that focus, introducing heavy-handed plotting on prepackaged narratives, with the result that PCs became increasingly consigned to enacting preordained roles. In fact, as far as I’m concerned, it got to the point that modules weren’t really “modules” anymore — things you could pick up and drop into your own adventure with ease. They became the adventures themselves, which defeated the whole concept of interchangeability that was inherent to a “module”. And of course, by the time of 3rd edition D&D (in 2000), the term “module” had indeed been officially dropped in favor of “adventure”. But that switch in terminology should have occurred sometime in the mid to late ’80s, prior to the release of even 2nd edition D&D. Story supplanted design to the extent that role-playing felt more and more like script-slavery. This isn’t to say (as Maliszewski emphasizes) that old-school gamers didn’t create their own stories; far from it. The point is that they were their own stories, not the module authors’, and more importantly, the stories grew by the spontaneity (and often unpredictability) of the players’ seat-of-the-pants actions. Post-1983 modules were, to use the old-school cuss word, “railroady”, meaning they forced players on too many paths or plots to make the module “work”. There’s obviously some degree of railroading to any D&D campaign (otherwise it could be hard to get one off the ground), but the ratio of PC free will to DM predestination was large by design in the old days. DMs were trained to expect the unexpected from their players, and to shift gears accordingly. Let’s be frank: there haven’t been awesomely inspiring modules like Tomb of Horrors, The Lost City, Castle Amber, and Vault of the Drow in a long time. They succeeded so well, and remain classics, because they detailed as much as they inspired, around minimal plotting. They were suitable as self-standing isolated affairs, but could just as easily be worked into larger campaigns — adventures, that is, determined by the interactive dynamic between DMs and players.